Realm was born out of an amazing friendship, two renovations, and an endless appetite for all things design. Upon completion of their own remodeling projects, it became clear that Laura and Liza’s combined strengths and passion for interior design could blossom into something wonderful. These designers draw inspiration from the iconic places they've lived — San Francisco, Denver, Boston, and beyond. They find true delight in incorporating styles from design hotspots, countrywide. Liza is a lifelong New Englander. Aesthetics and design have been core to Liza’s career. She first began in fashion, helping to launch a prominent high-end boutique in the Boston area. There, she spent her time learning the components of running a business - from working with the back office/ accountants to accompanying the owner on buying trips to NYC. Marrying her best friend from college, Liza and her husband relocated to Denver - there her focus turned to interiors where she spent the next few years attending interior design school. Job opportunities brought Liza and her husband back to Boston, where she landed a transformative job with an interior design firm. Liza spent the next couple years coordinating and overseeing residential and commercial projects in and around Boston. After taking some time off to start a family and complete a major home renovation, she decided it was time to return to design. Liza loves all design projects, big or small... she thrives on the challenges, as well as cultivating relationships with both clients and contractors. Selecting the perfect palette, furniture and finishes to create cohesive and warm spaces is what inspires Liza most. Liza has a B.A. in Anthropology with a Minor in Education from Colby College in Waterville, ME. Liza currently lives in Winchester, with her husband and two boys, and zany puppy. Laura grew up in Virginia Beach, Virginia, but has spent most of her adult life living on the West Coast. Branding and design have long been a focus for her. Prior to stepping into the design world, Laura held key posts in publishing, both with Conde Nast (SELF) and Hearst (CosmoGIRL!, Marie Claire) brands. Outside of publishing, Laura ran her own PR and Marketing consulting firm focusing on clients in the wellness and beauty spaces. In 2015, Laura and her family were relocated from Mill Valley, CA to Winchester, MA. 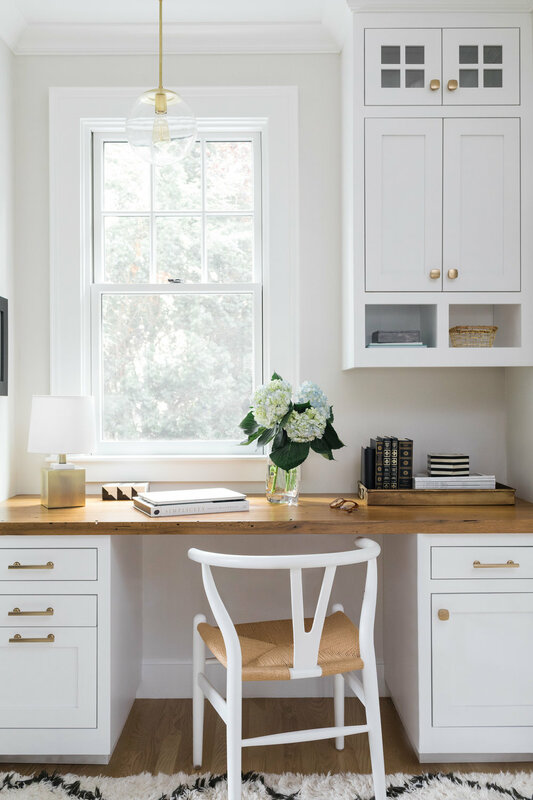 After managing and overseeing two large scale renovations, one in CA and another most recently in Winchester, Laura soon identified remodeling and design as her passion. Laura is invigorated by re-purposing and creating new spaces. While her sweet spot is renovating older homes, she appreciates the clean lines, symmetry, and functionality of new ones. With each project, whether it be a new construction or vintage home, the challenge and the ability to bring things seamlessly together is what drives and inspires her. Laura holds a B.A. in Sociology from James Madison University. She lives in Winchester with her husband, two kids, and dog Hershey, a rescue chihuahua terrier mix.